Thank you for sharing and for the reminder - I kind of lost my way for a brief moment. 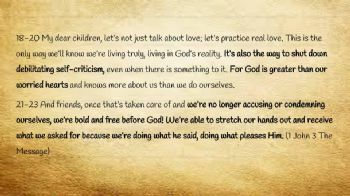 18-20 My dear children, let’s not just talk about love; let’s practice real love. This is the only way we’ll know we’re living truly, living in God’s reality. It’s also the way to shut down debilitating self-criticism, even when there is something to it. For God is greater than our worried hearts and knows more about us than we do ourselves. Amen,,,, some of it was hard to read.